William Wood was the owner of several copper and tin mines in England and he hoped to make a large profit via the production of coins for use in Ireland and America. 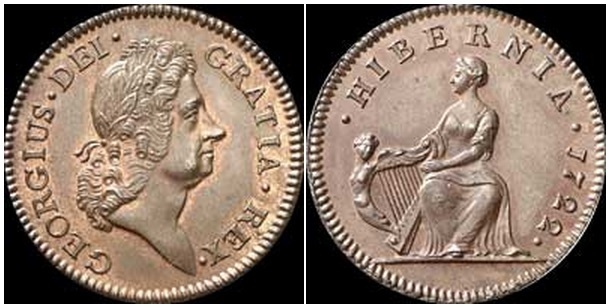 During the first half of 1722 King George I’s mistress (who had followed him over from Germany), the Duchess of Kendal, obtained a patent from the Earl of Sunderland for coining copper money for Ireland. Wood thought this would be a profitable enterprise so he purchased the royal patent from the duchess for £10,000. In his indenture from George I dated June 16, 1722 Wood was authorized to produce up to 360 tons of halfpence and farthings for Ireland at 30 pence to the pound over a period of fourteen years for an annual fee of £800 paid to the king. 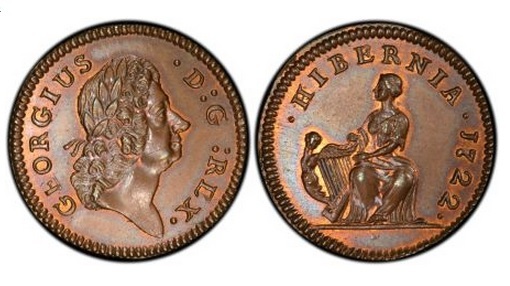 These Hibernia coins were heavier and thus intrinsically more valuable than the coppers then circulating in Ireland. They were certainly less profitable for Wood to mint than his 50% lighter weight ‘Rosa Americana’ copper issues. Wood was authorized to make 120 halfpence to the pound (compared to forty-six halfpence to the pound at the Tower of London mint) which, according to Mossman, would yield a 140% profit after adjusting for production costs. Small wonder the American colonists rebelled less than 50 years later ! 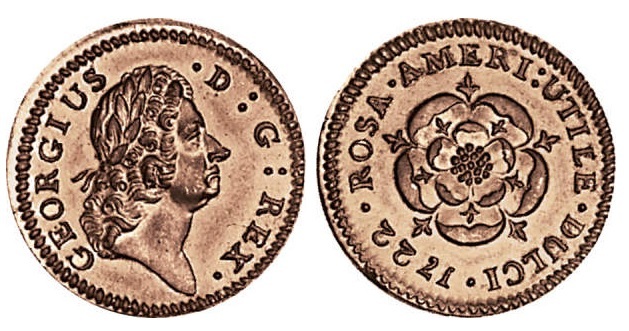 The Rosa Americana pieces were issued in three denominations—half penny, penny, and twopence—and were intended for America. This type had a fully bloomed rose on the reverse with the words ROSA AMERICANA UTILE DULCI (“American Rose—Useful and Pleasant”). When including the costs of production, plus the £10,000 fee paid to the Duchess of Kendal, it has been calculated that Wood would have lost £4,871 over the fourteen years of the patent. 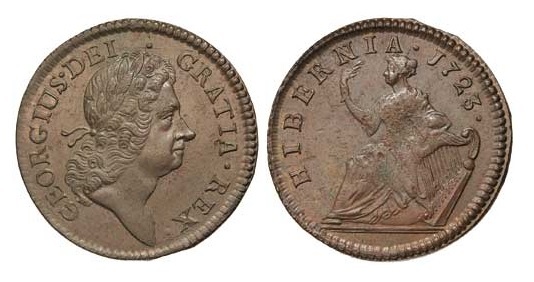 Therefore, from Wood’s viewpoint, the Hibernia coin specifications were too generous based on the cost of production – well, actually, there was a profit of over £5,000 in normal circumstances, so it was the sum of £10,000 that he paid the Duchess of Kendall that caused the problem ! Contrary to popular opinion, it now seems that Wood did not produce under-weight coins for Ireland and that he did, in fact, reduce his potential losses by ‘drip-feeding the initial supply into Ireland hoping that his contract would be recinded. It has also generally been held that the Irish did not accept the Hibernia coppers and much has been said about Dean Swift’s Drapier Letters, the duplicity of the Irish authorities and the political intrigues of the Tories and Whigs in England. However, recent research (and the frequency of coin finds in Ireland) suggests that Wood’s coins were accepted at first. It would appear that, over time, the Irish people and merchants gradually neglected the coins. It is a popular myth that the Irish refused to use the coinage on nationalistic grounds and that they relied on copper tokens (and, possibly, the Saint Patrick coppers) but this seems unlikely. What they needed was good quality silver coinage of sixpence, shillings, half crowns and crowns. These coins are available in much better condition than the earlier regal copper issues and uncirculated coins with considerable red mint lustre are available albeit scarce and expensive. Wood’s Coinage is actively collected as part of the American ‘colonial series’ so there are listings of their values in the ‘Red Book’, the ‘Blue Book’ and from many other US sources – including numerous American numismatic websites. 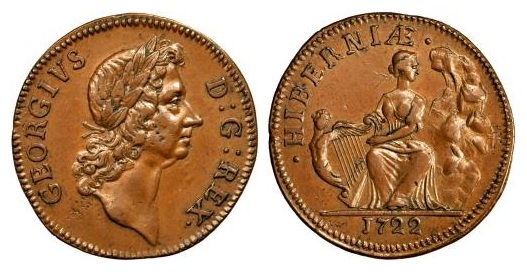 William Wood’s ‘Hibernia’ type Farthing. Wood’s mint, possibly in London or Bristol. 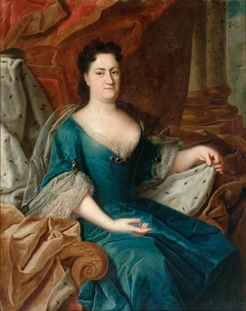 1723. Laureate head right / Hibernia seated left on globe, holding palm frond in right hand, resting left elbow upon harp. Martin dies 3.22/Ba.1 (EDS); D&F 525; SCBI –; SCBC 6604. VF, attractive brown patina. There are also a number of patterns available for this series. They are highly collectible and attract much attention when they appear at auction. They are available in a range of metals and a small number of varieties have been noted. For the specialist collector, there are a number of other (less obvious) varieties of these coins. For the Hibernia farthing Nelson listed six types, which Breen expanded to eleven. with four sub-varieties of reverse B based on the number of harp strings (between nine and twelve), for a total of eleven reverses. For the Hibernia halfpence Nelson listed nine types, which Breen expanded to twenty five. Several different device punches were used for the royal bust and Hibernia (Martin states there are at least three different laurel wreath styles and several variations on Hibernia’s belt). Interestingly, the device punches for Hibernia had a blank harp so the strings were cut into the individual dies. The engravers did not always use the same number of strings on the harp so that there could be a number of variations from a single Hibernia device. Additionally, many different letter punches were used and they are found in a variety of combinations. When adding all of these possibilities as well as different letter alignment and various die states due to cracks and re-cutting the number of varieties is quite large. 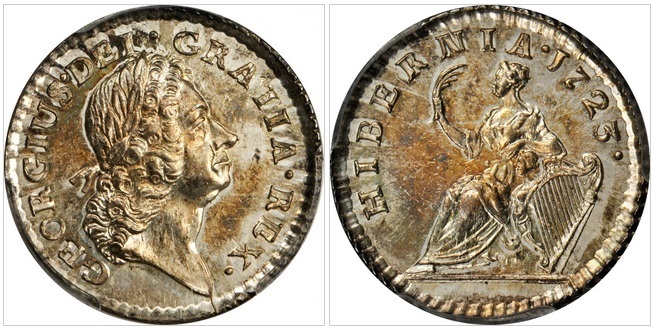 Further, Martin has suggested (as Hodder has shown for New Jersey coppers) that the emission sequence of these dies was not continuous or in strict chronological order, thus a 1722 obverse would be replaced with a 1723 obverse and then later re-used. I have just found a 1723 Hibernia halfpenny under uor house floor — It doesn’t look like a production coin as it has what appears to be a stress crack plus some compressed copper lumps in the surface. Would you like a photograph ?